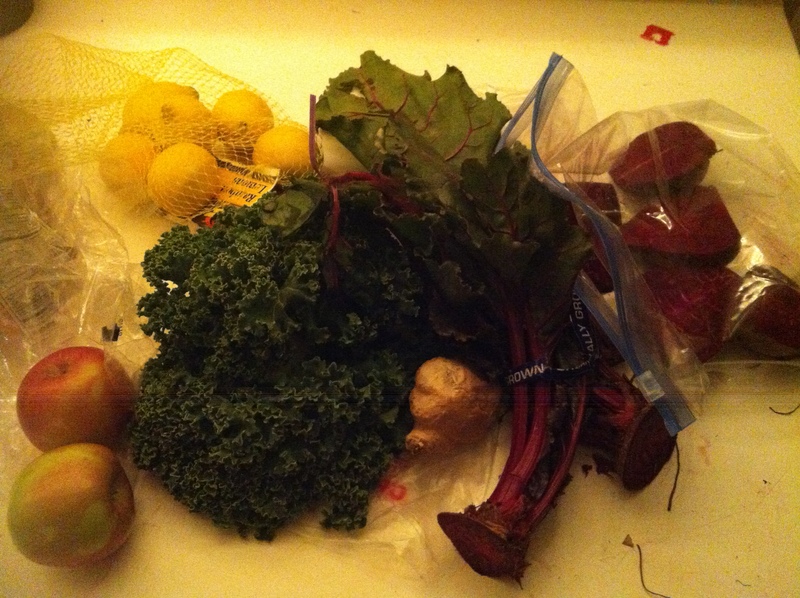 Perhaps one of the best habits my weight loss journey has brought me to is juicing. If you had asked me a year ago if I would ever consider buying a juicer and using it to juice fresh fruits and vegetables on a daily basis, I would have said absolutely not. I mean, what a ridiculous concept – time consuming, expensive, and who wants to eat juiced kale?? I was perusing Netflix about 6 months ago looking for health documentaries (I am obsessed with current health trends and research) when I came across a movie called Fat, Sick, and Nearly Dead. It’s the story of an Australian man who goes on a quest to cure his body of a chronic disease that was causing him to spontaneously break into hives. What was his method? 60 days of drinking only fresh juice, followed by a 6-month diet comprised of fruits, vegetables, whole grains, and beans. And you know what? It worked. He lost 75 pounds in 60 days and by the end of his 6-month follow-up diet, he was completely off all his medication. Cured. The next day I bought a juicer. What is so great about it, you ask? Well, I’ll leave it to you to watch movie and learn all the details, but he basic premise is this: fresh fruits and vegetables contain absurd amount of nutrients and phytochemicals that your body needs to thrive. By juicing a mess of veggies and fruits, you are hyper-concentrating the nutrition of what would be three meals of vegetables into one drink that your body can absorb almost instantly. I can honestly tell you that adding juice to my diet (it’s my breakfast every morning) has really been integral in my struggle for balance and healthy weight. If you read my post from earlier today, you know I’ve been battling a head cold for the past week. Though what I want is comfort food, what I know my body will really benefit from is my Magic Green Elixir – the recipe I have settled on as my go-to juice. You of course can juice anything you like, but what’s important is making sure it’s green. 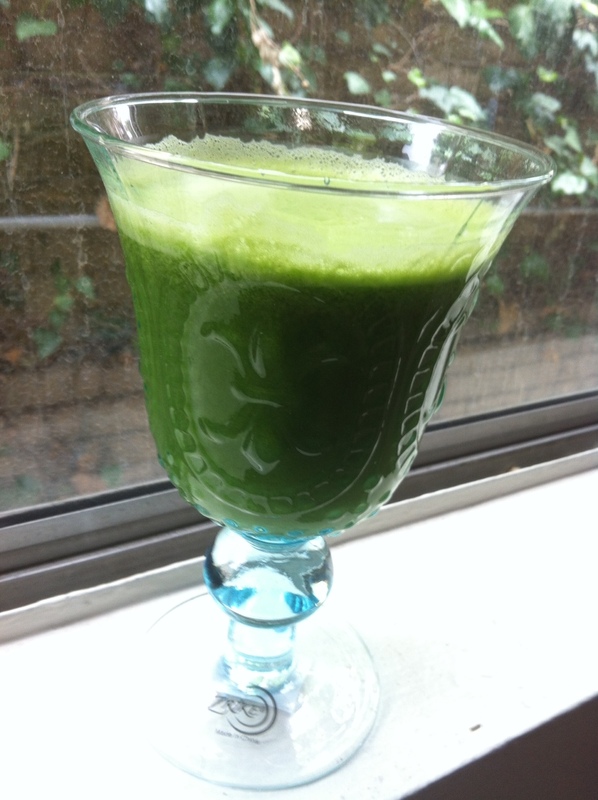 The nutrients you get from Kale or any leafy greens are what really make the juice worthwhile. Now I know some of you are thinking, wait, I thought you were the starving artist – how can you just go out and drop $140 on a juicer? Simple answer: timing. If I saw the movie this week, I would certainly not be buying a juicer. However, I happened to have a little wiggle room and decided I wanted to make it happen. And honestly I’ve used the juicer almost every day since then. Absolutely worth it. Also I should say that I don’t necessarily encourage you to go on a full on juice fast. I mean, if you want to and your doctor says it’s ok, go for it. But I have to tell you I tried it for two weeks. I lost a good chunk of weight, like 17 pounds, but once I was done I went on vacation and guess what? It all came back… and then some. I think if you’re looking to jump start a new healthy regimen, juice fasting for a day or two first can be a great way to jump start. But for me, I find that using juice as part of my every day health-conscious diet works best for me. I’ve decided to drink juice twice a day today and tomorrow and see if it helps get me better faster. We’ll see how it goes. Does anyone out there juice? Any favorite recipes or success stories?